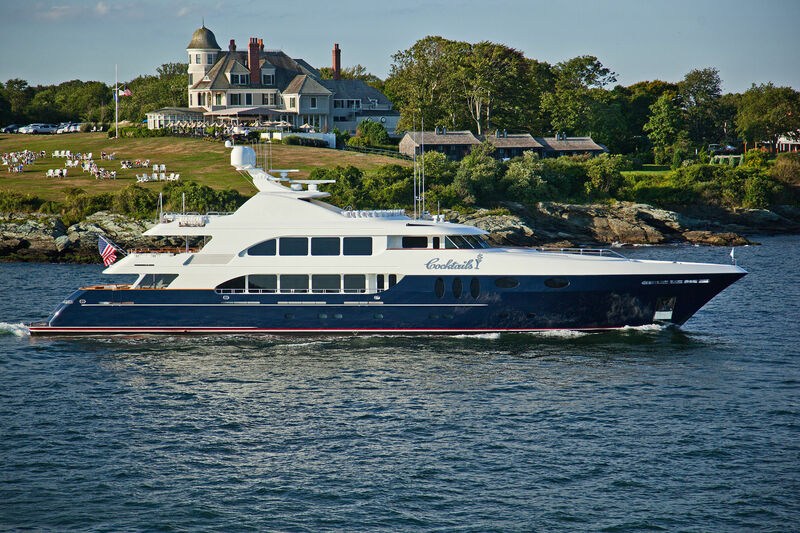 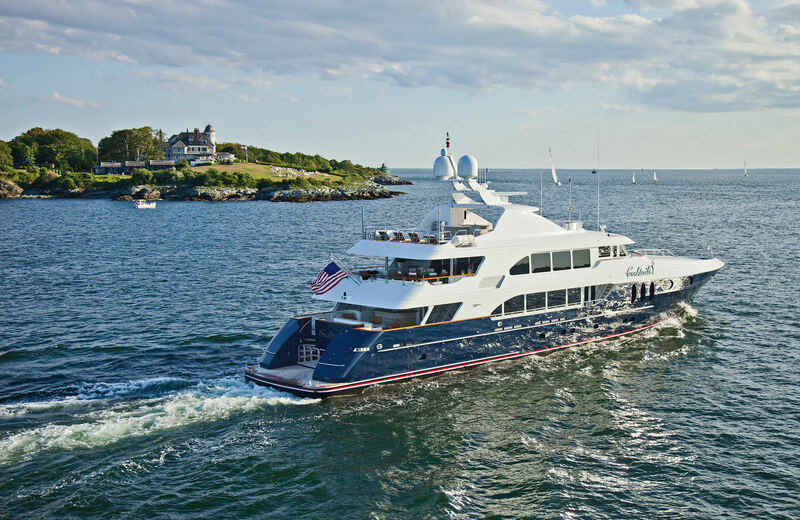 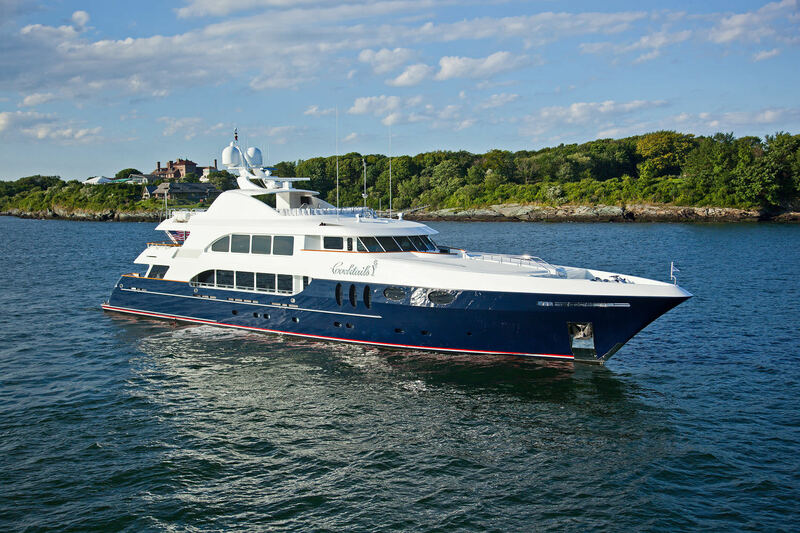 Luxury motor yacht ALESSANDRA (ex COCKTAILS, Janie, Chevy Toy) is a 47.85m (157') superyacht from the American Trinity Yachts shipyard, built in 2004 while she was refitted in 2012 and 2018. 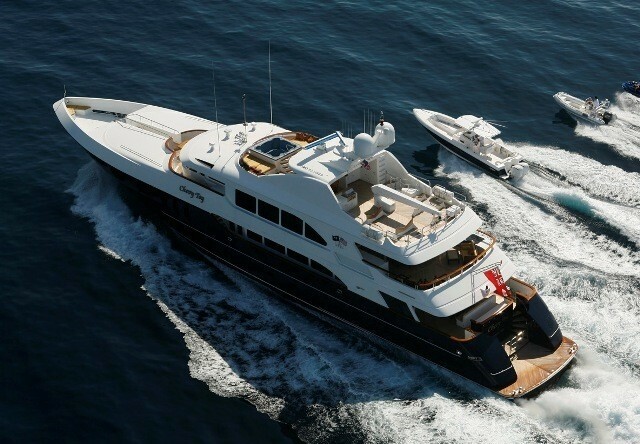 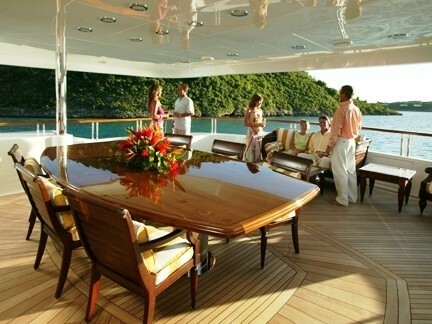 Motor yacht ALESSANDRA offers a very complete list of all the luxuries one can imagine. 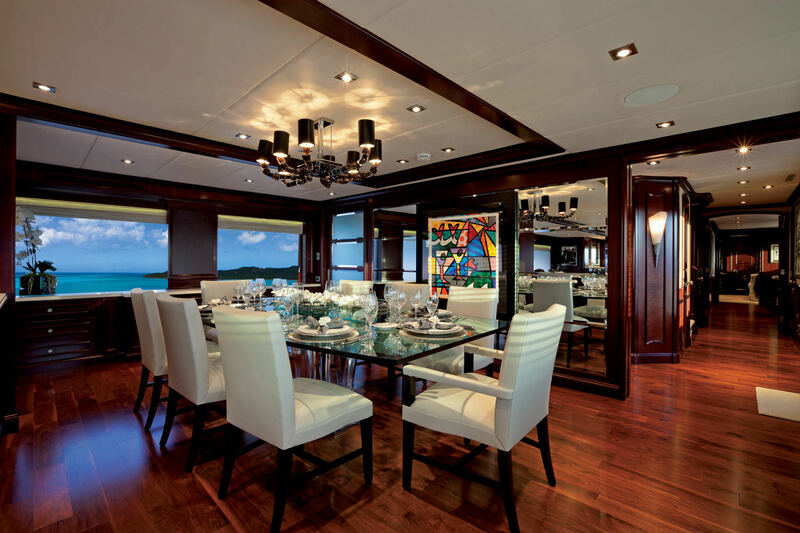 ALESSANDRA was the creation of interior designer Howard Designs and is traditional in styling, featuring great use of natural timbers, meticulously balanced with fine marbles, glass and bespoke art throughout. 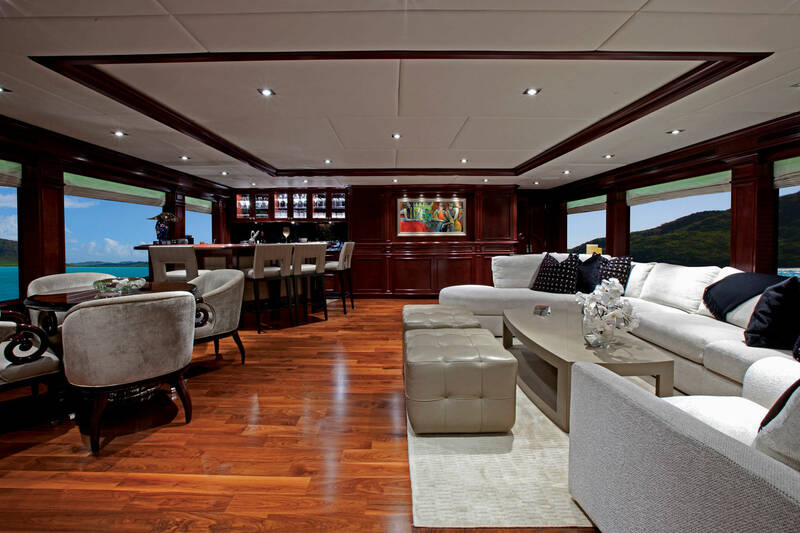 On the main deck, the salon is social and elegant, boasting crisp white leather soft furnishings, centered with a large coffee table, complete wet bar aft and formal dining area forward. 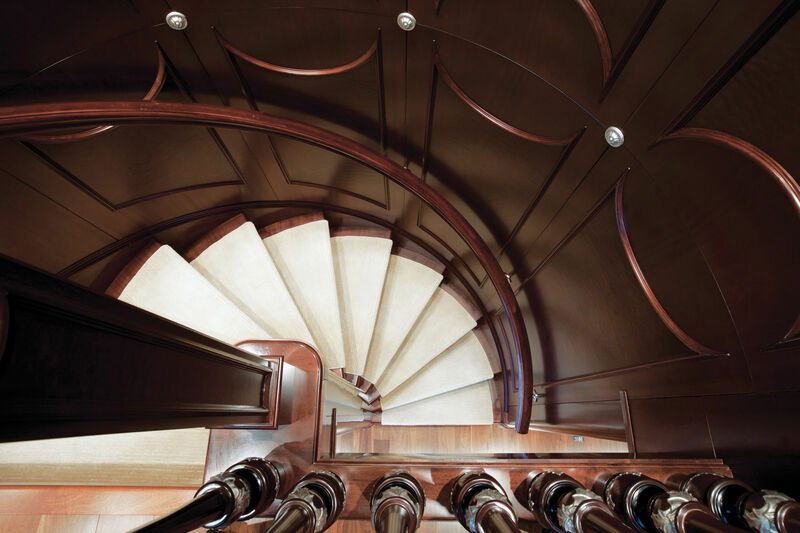 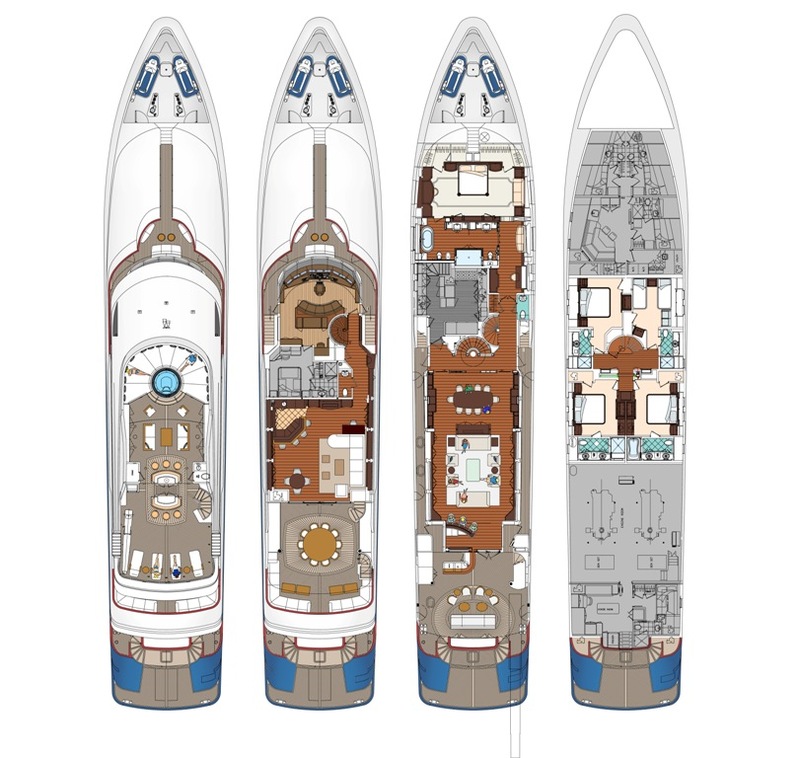 A spacious foyer on the starboard side leads forward to a day head, followed by a private foyer, to the full beam master stateroom. Further guest accommodation is on the lower deck, in 4 well-appointed en-suite guest cabins. 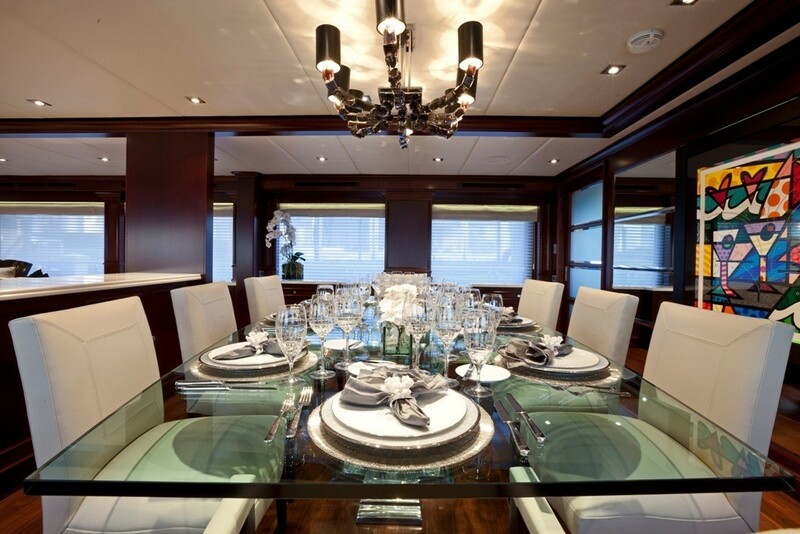 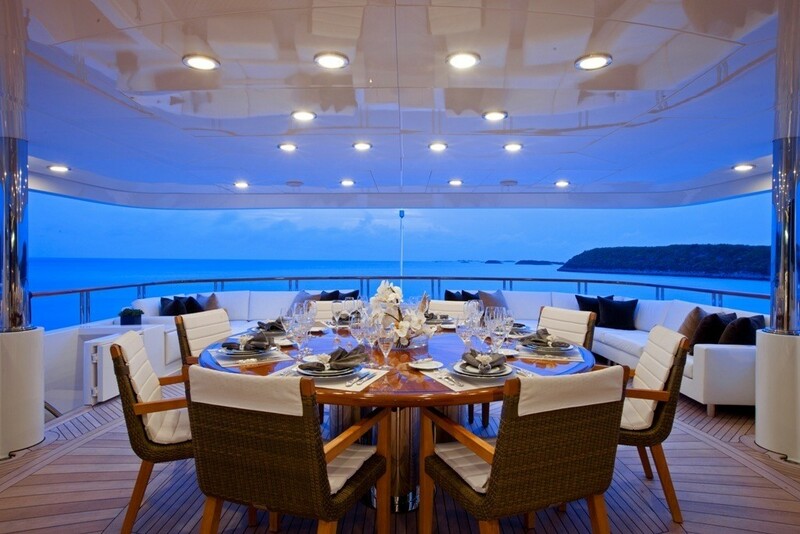 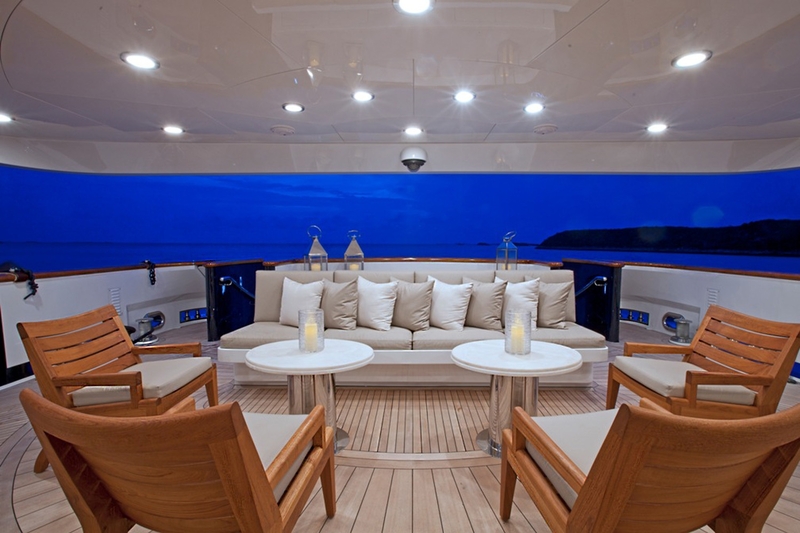 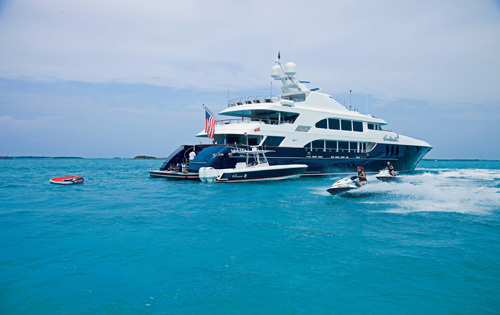 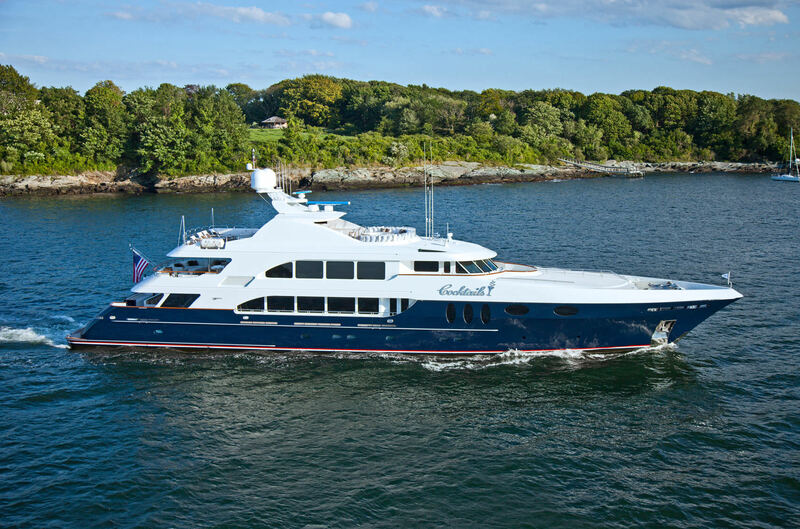 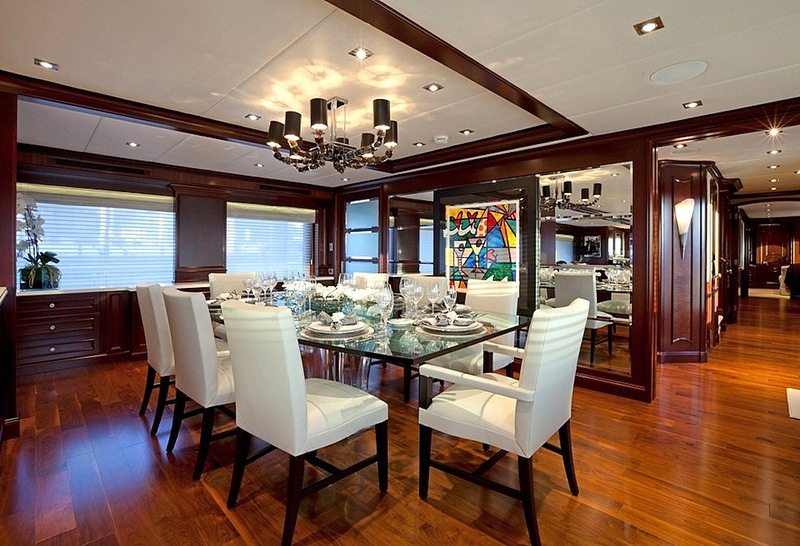 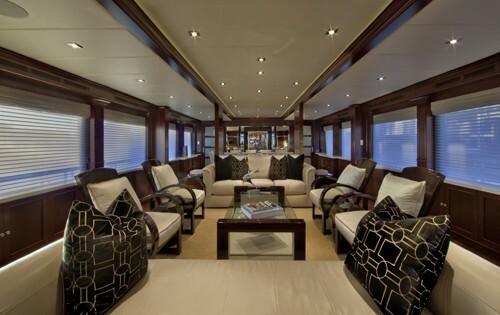 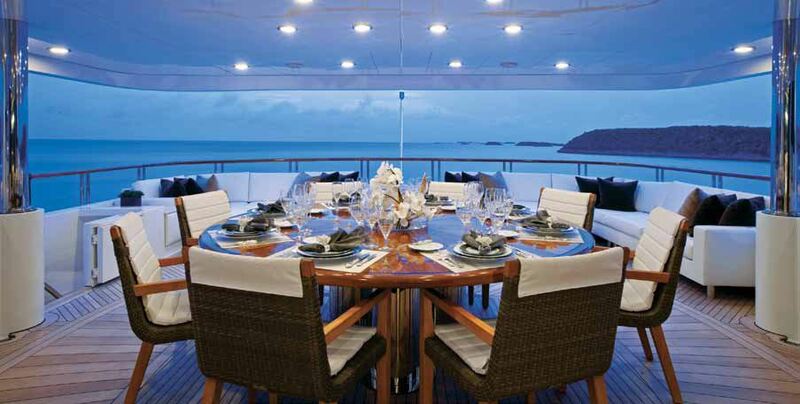 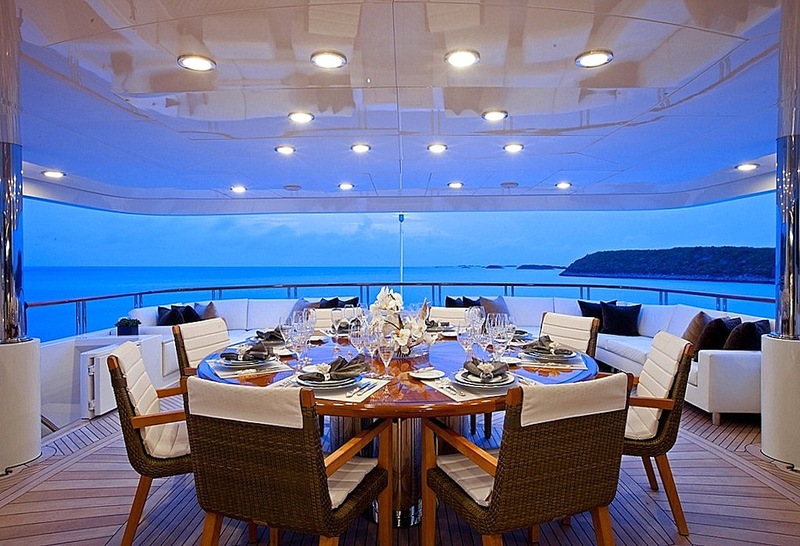 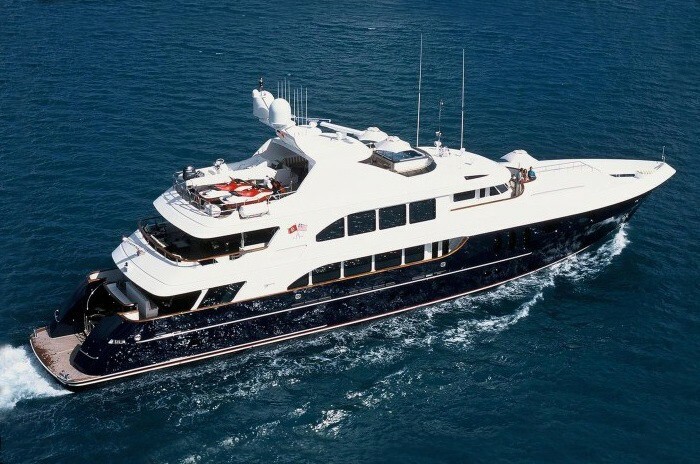 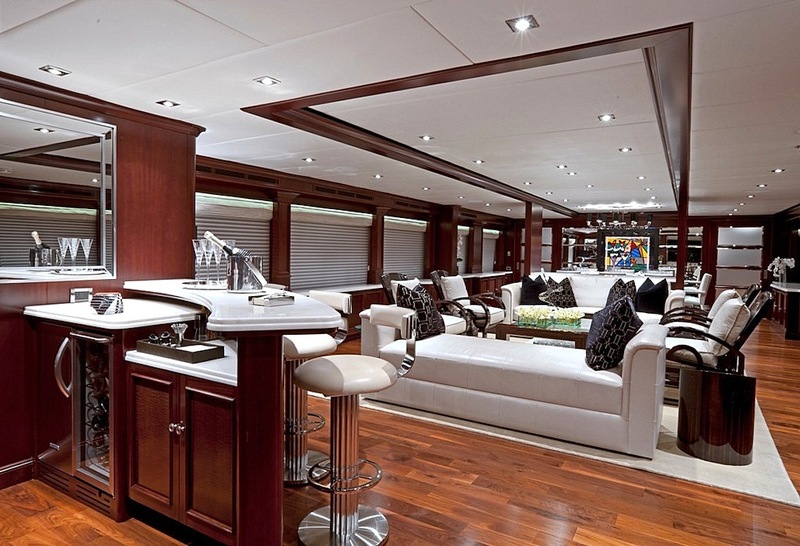 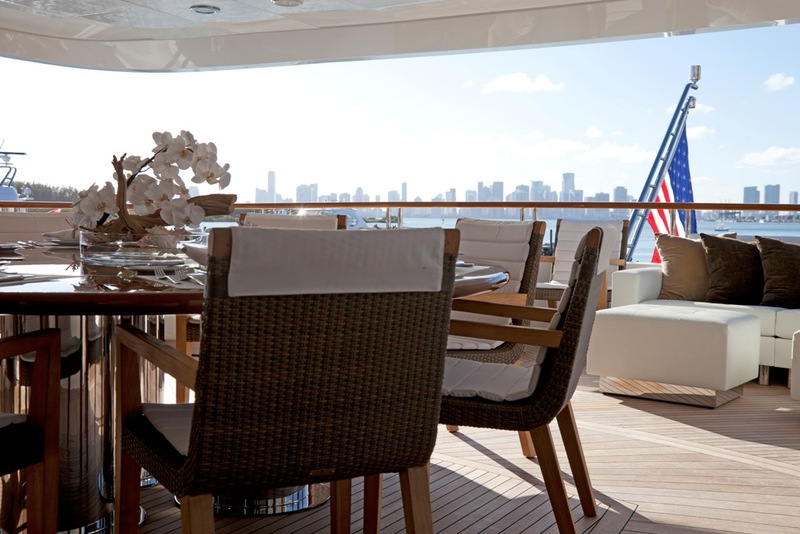 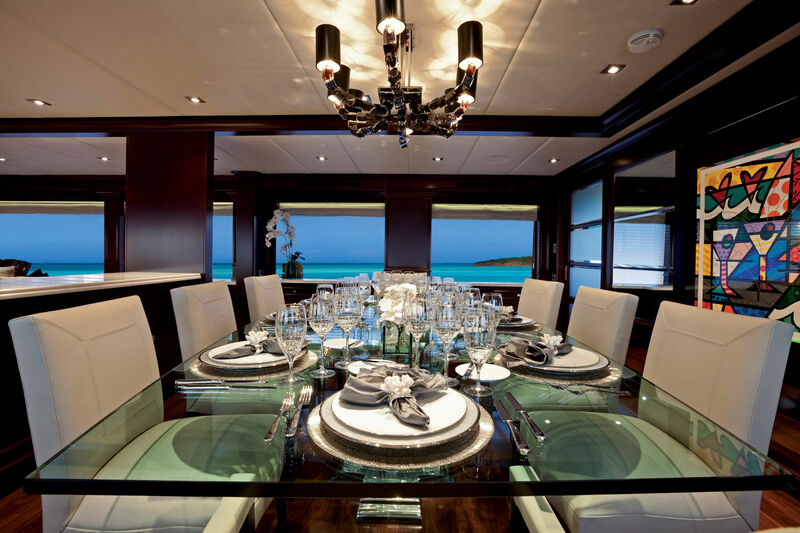 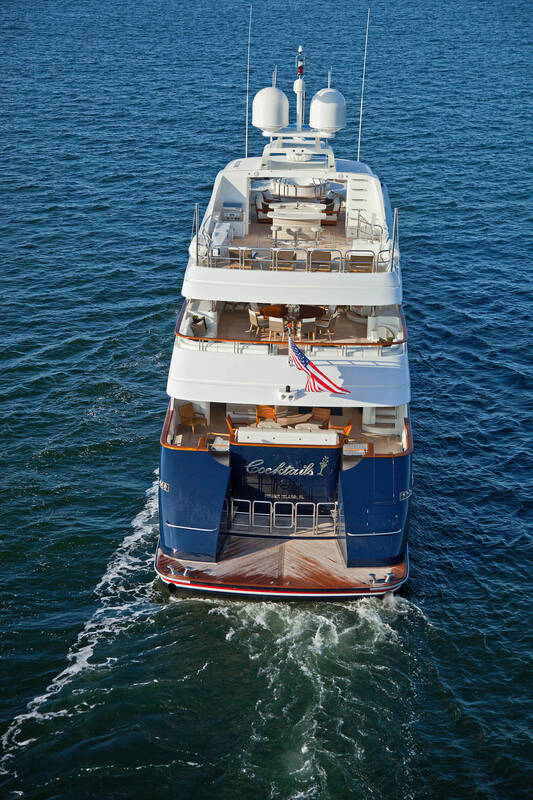 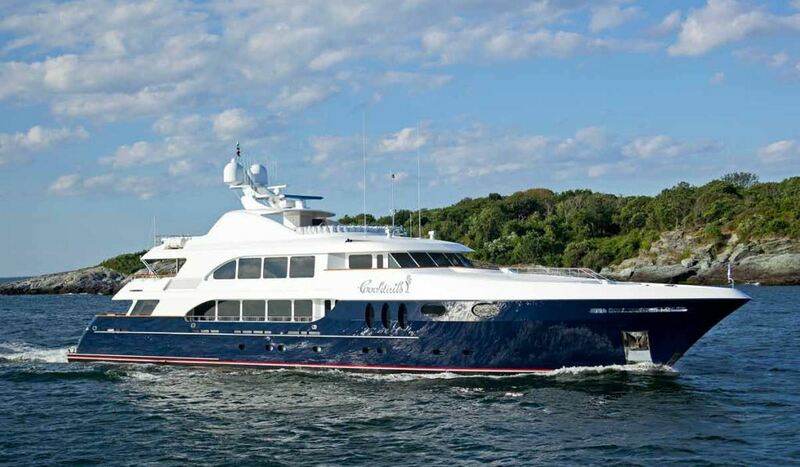 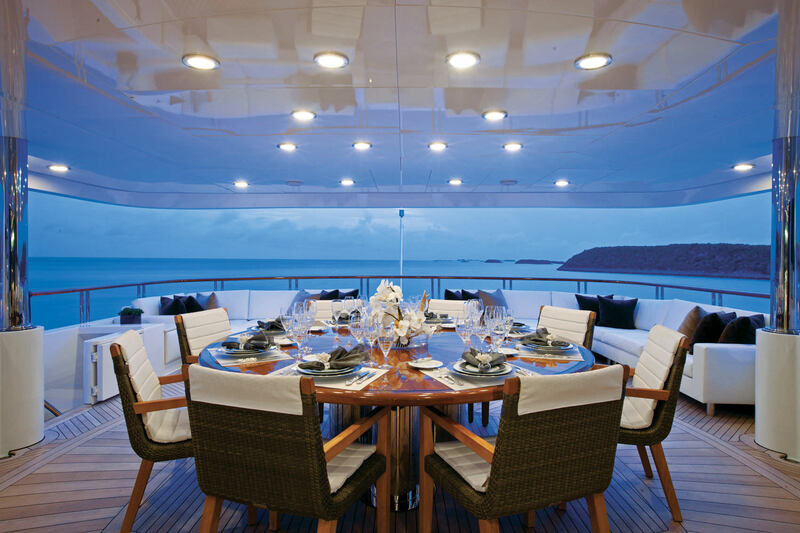 M/Y ALESSANDRA is a fabulous entertaining yacht, both indoors and out. 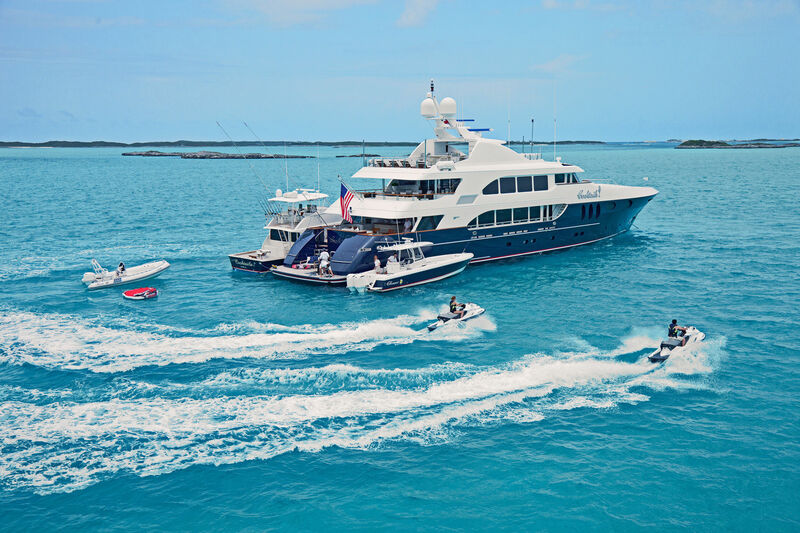 An upper skylounge accessed from the starboard side foyer, is another fantastic entertaining venue, offering a comfortable lounge, games table, wet bar, day head and full visual and audio systems. 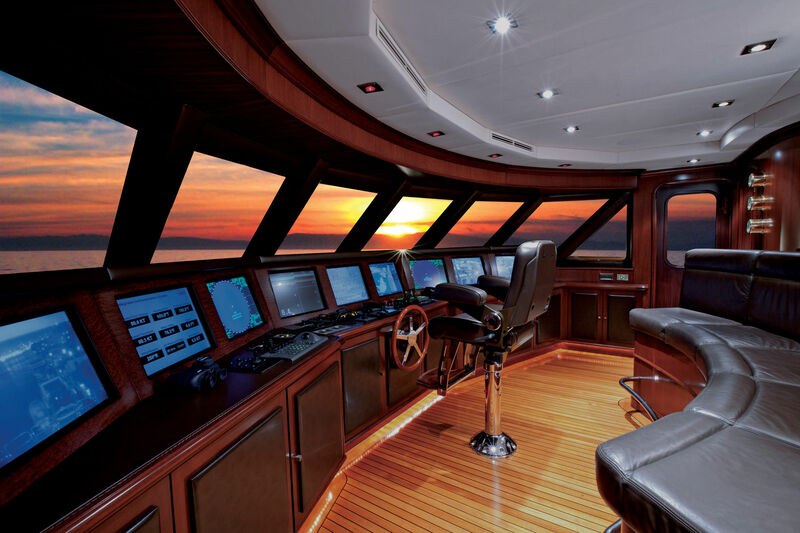 Included in her features list is an impressive array of large TV monitors which are all capable of split-screen displays, data overlays, and the like. 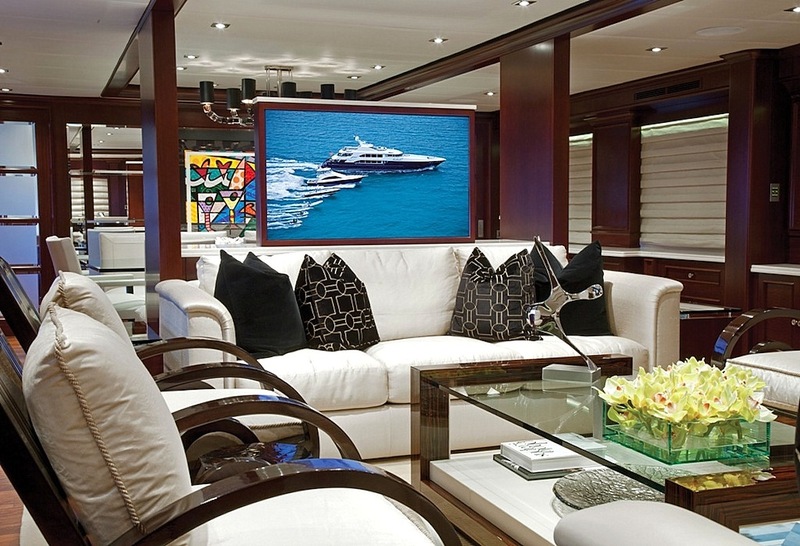 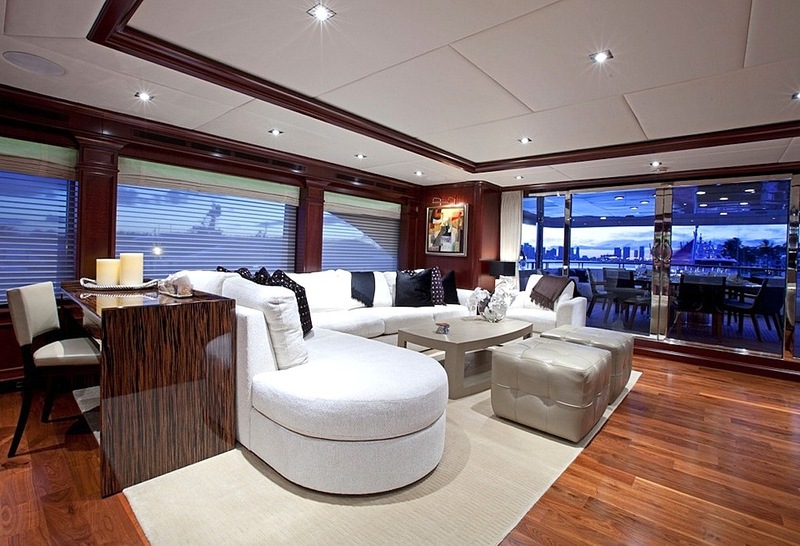 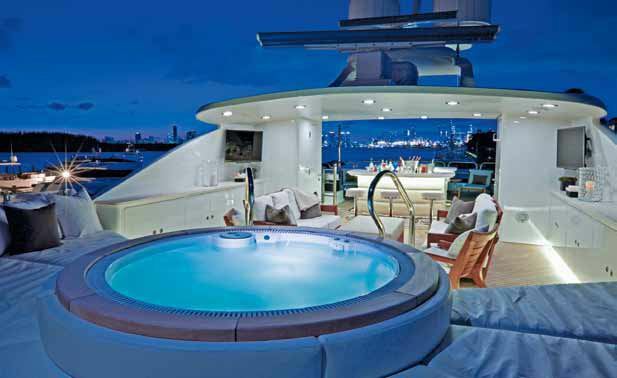 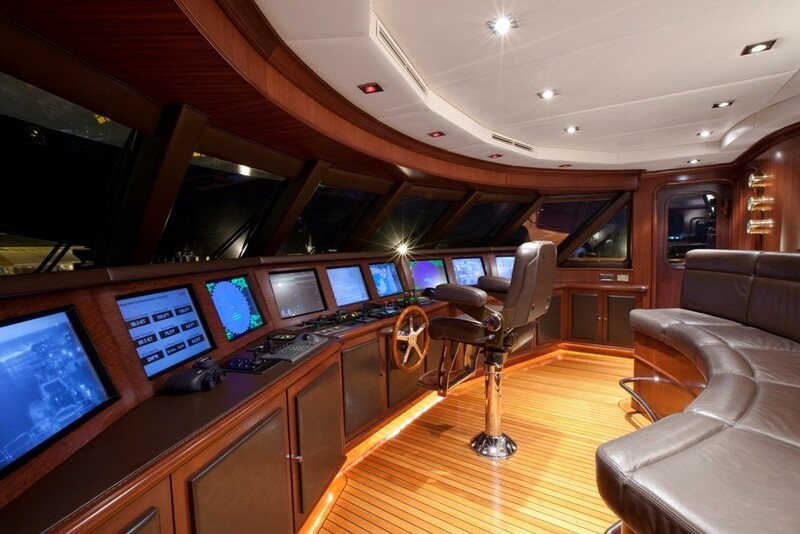 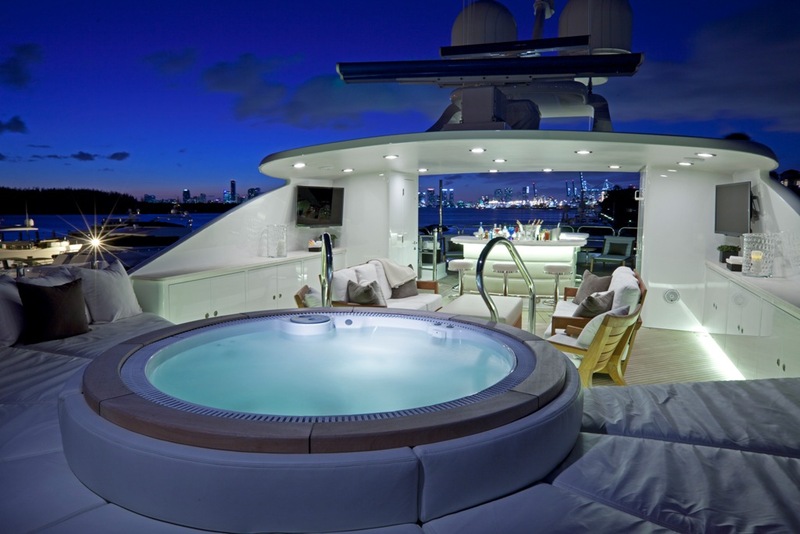 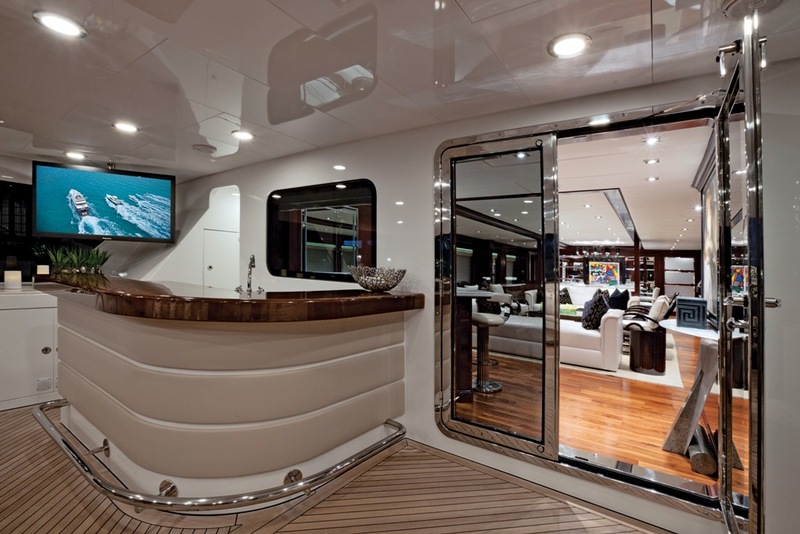 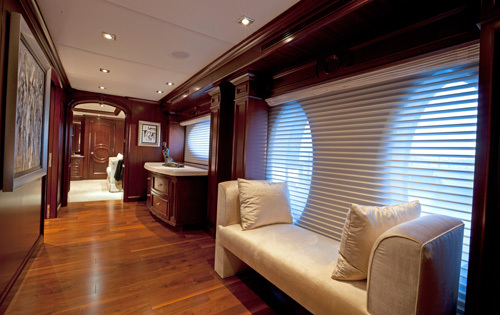 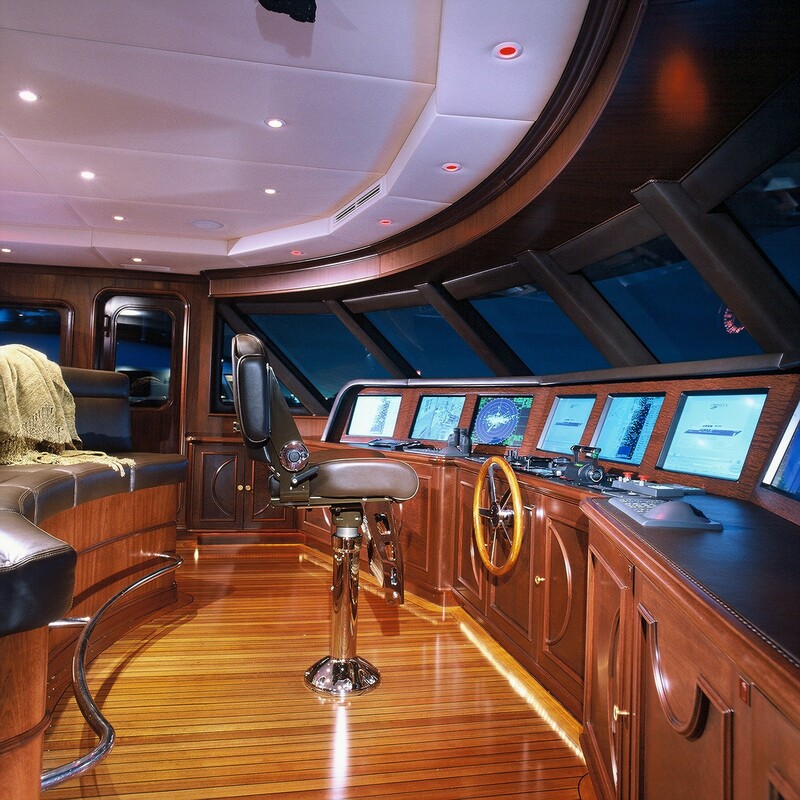 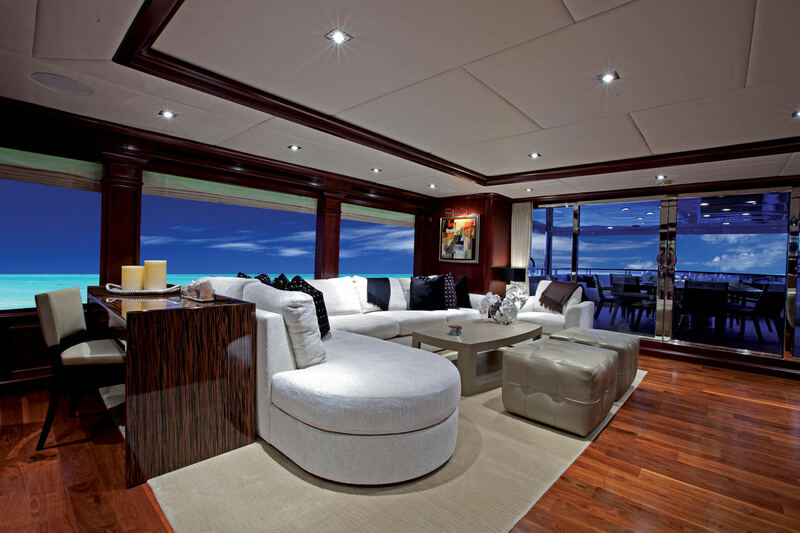 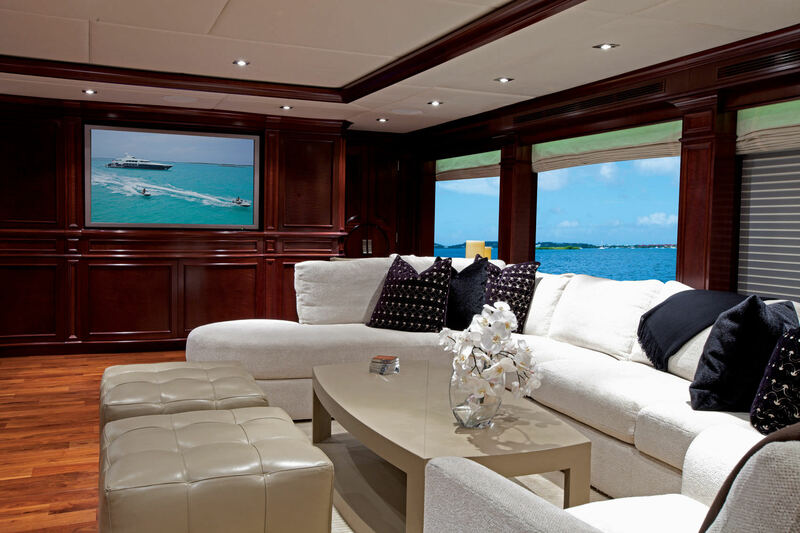 The yacht is a true entertainment palace and she boasts one of the most advanced electrical entertainment systems around. 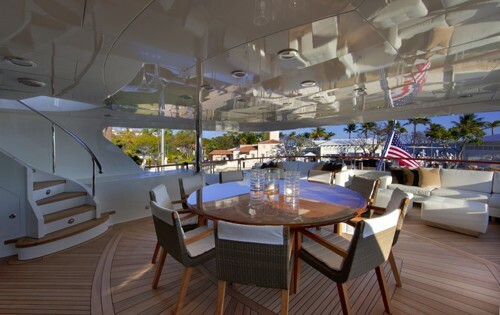 The vessel features an abundance of exterior living. 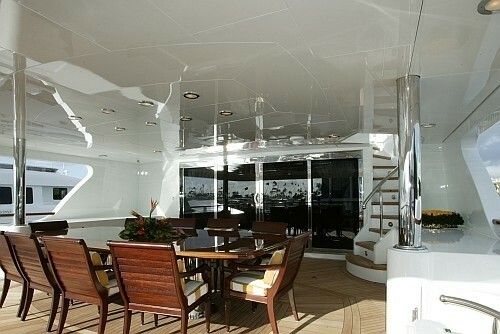 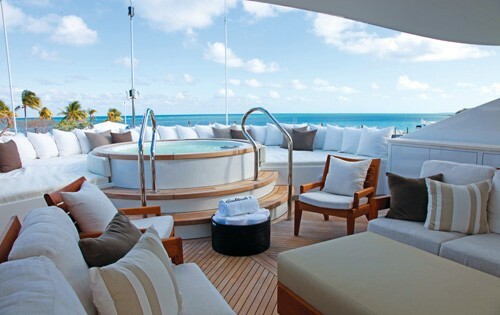 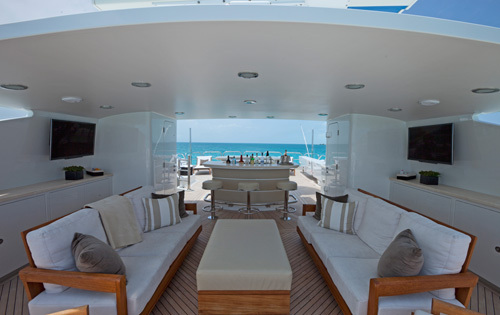 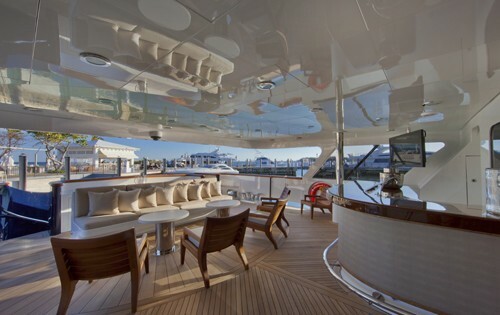 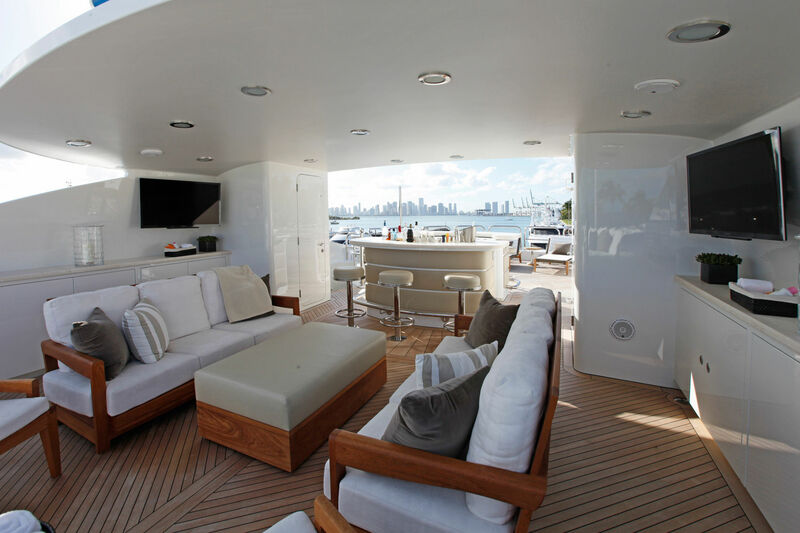 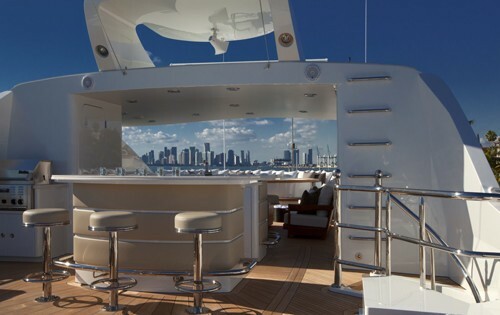 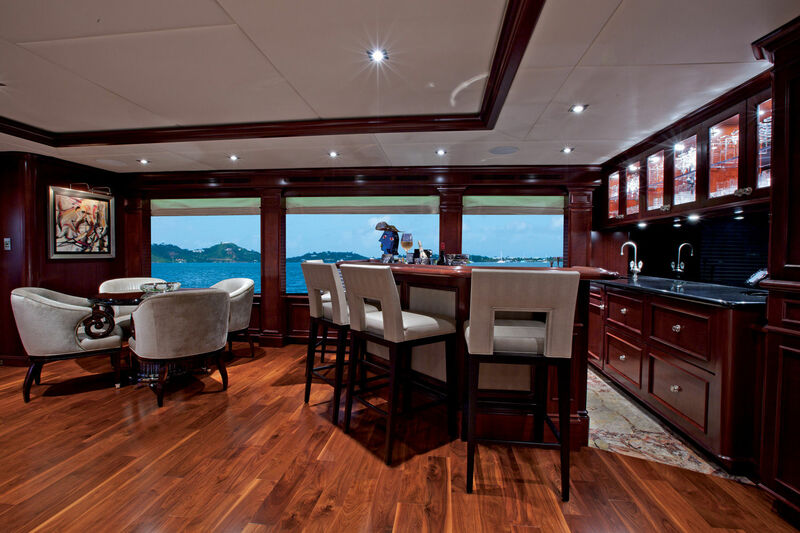 The main deck aft of the salon, offers a shaded deck space, with outdoor lounge seating, cocktail tables and wet bar. 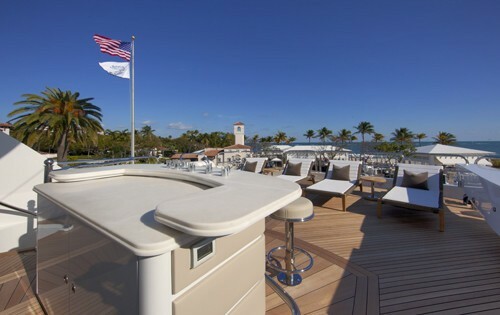 On the upper deck, adjacent to the skylounge, is the aft bridge deck, boasting an alfresco dining option, ample seating and shade. This Trinity yacht offers a Sky-deck Spa Pool with a Daylight Flat screen TV and a BBQ Grill as well as beach picnic equipment. 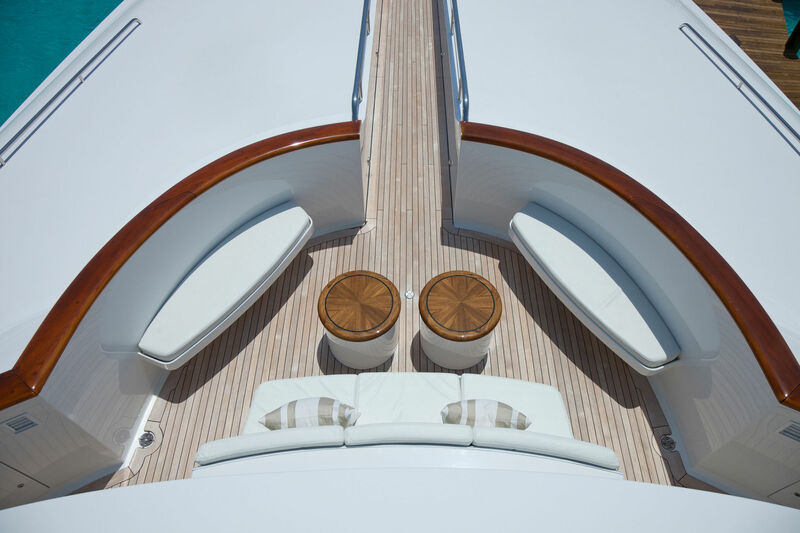 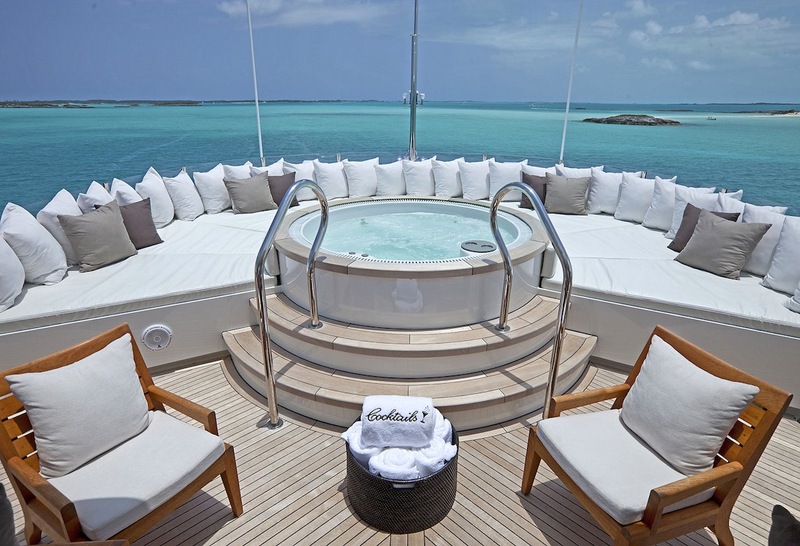 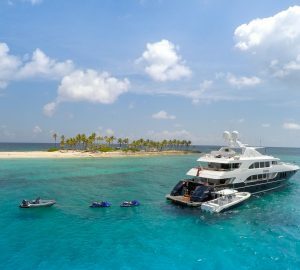 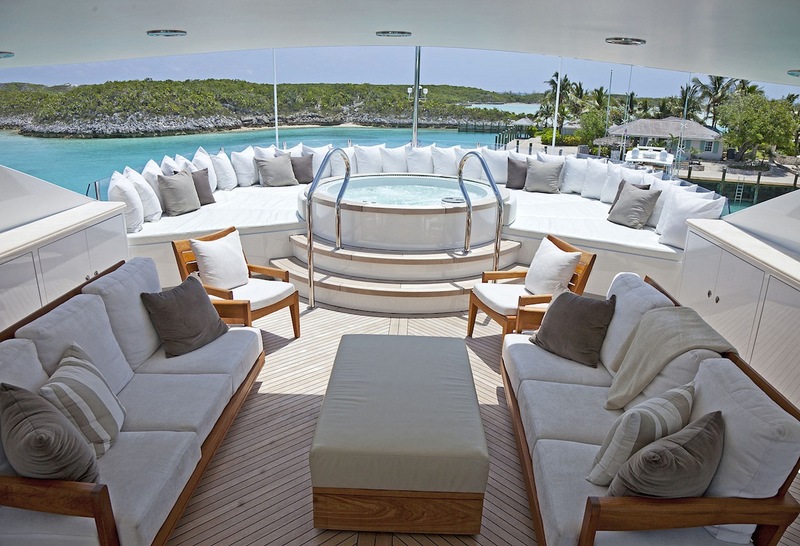 For the more active in the group, the yacht boasts an extended swim platform on the main deck, with access a great array of water toys on offer. 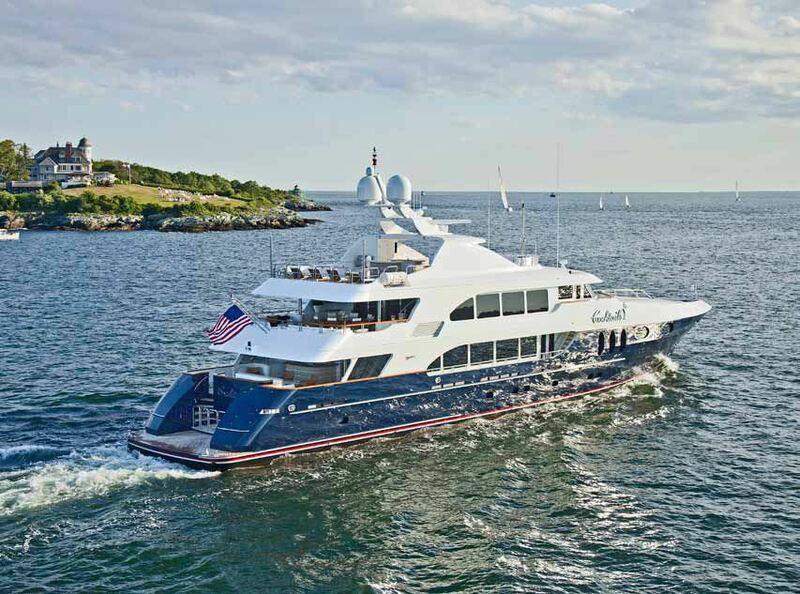 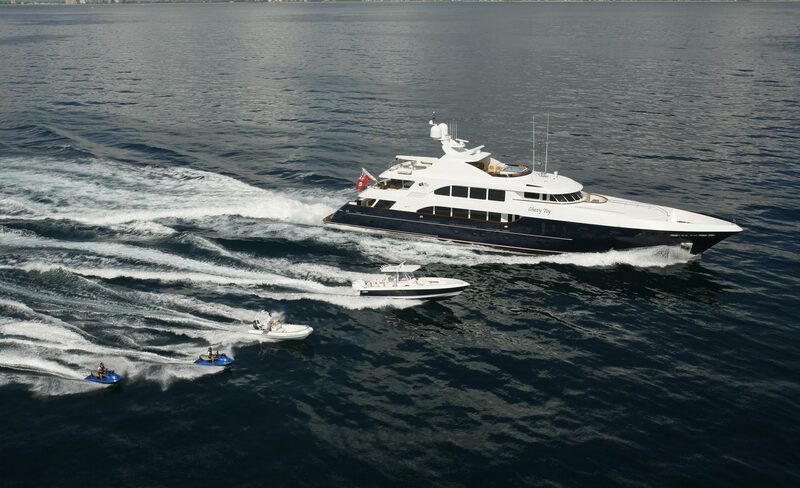 Powered by 2 x CAT 2,250hp engines, she is capable of 14 – 18 knots and an impressive range of 2,500 miles. 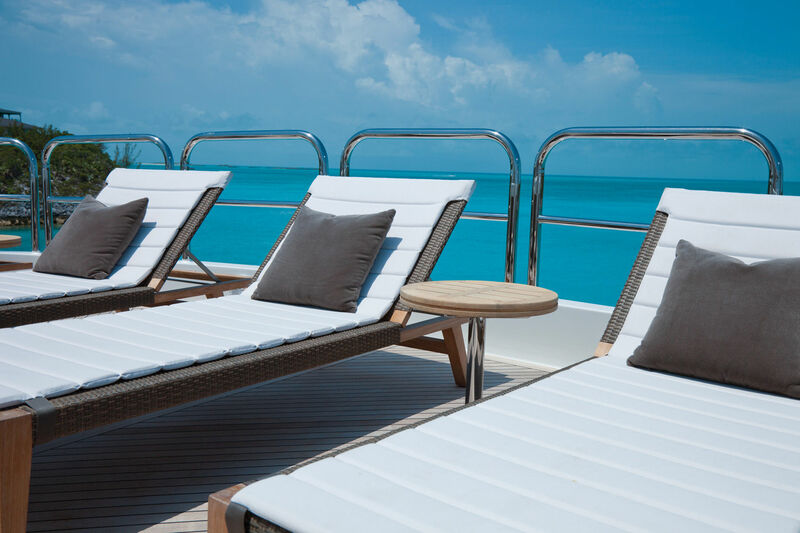 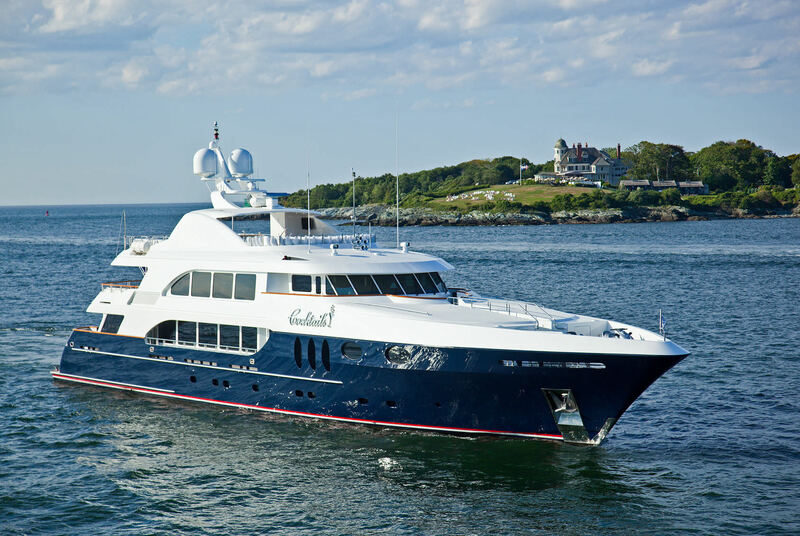 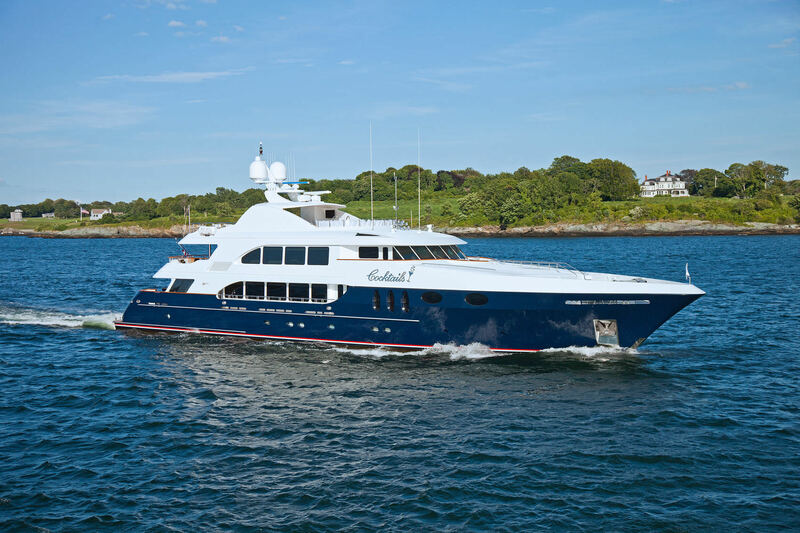 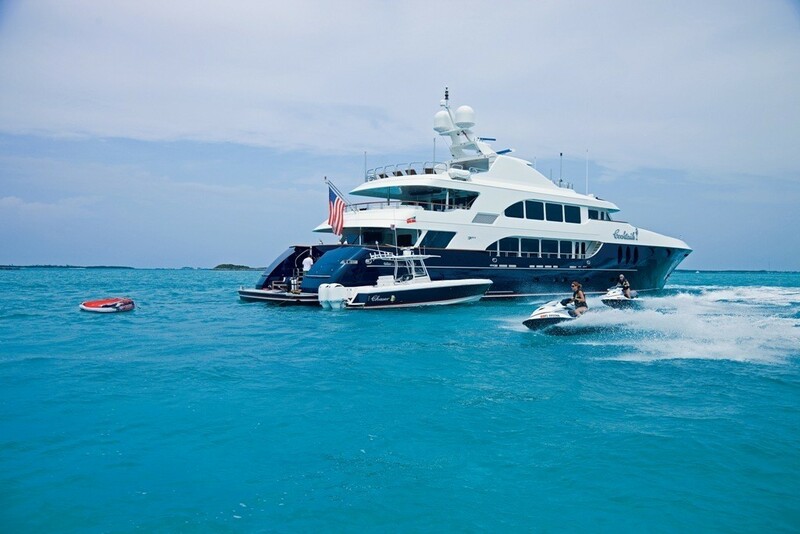 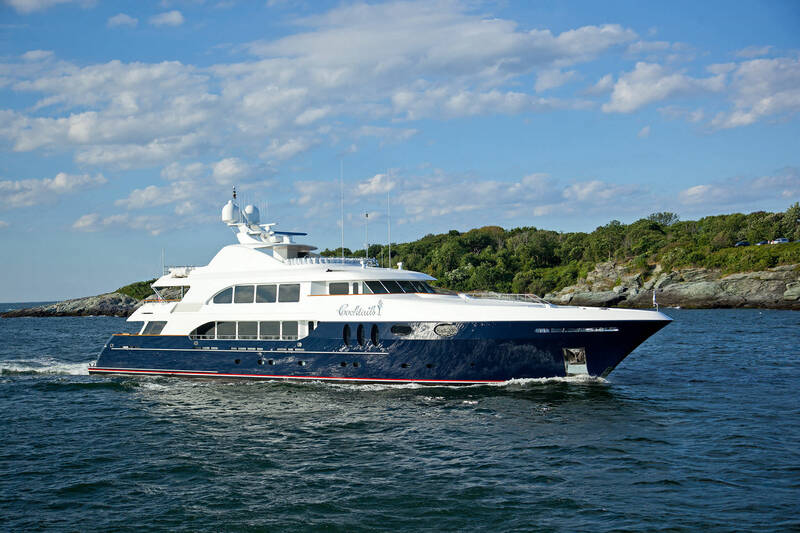 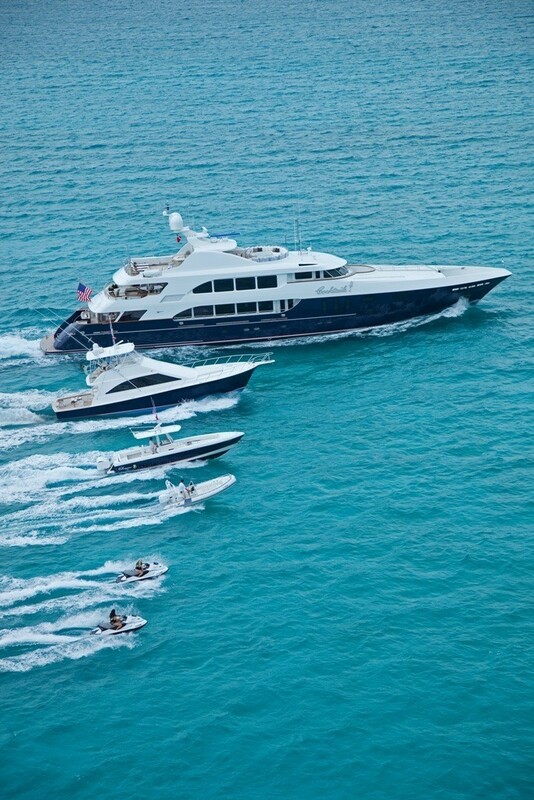 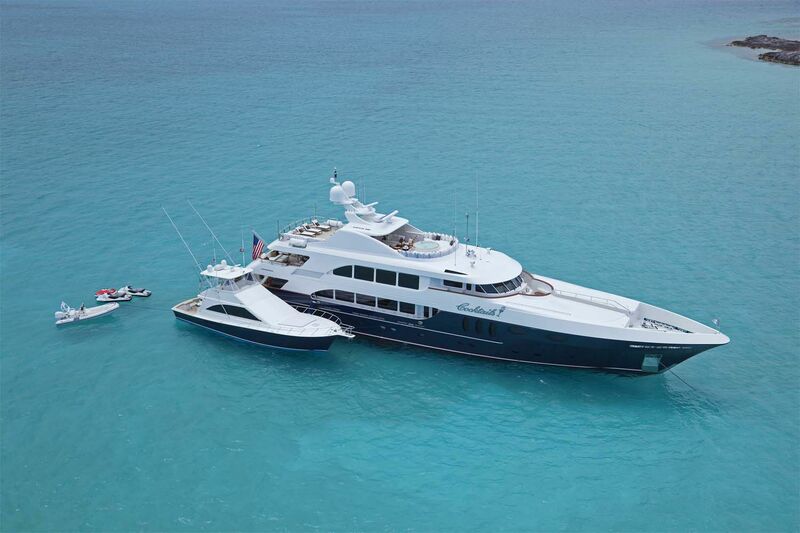 At anchor and underway stabilizers ensure a comfortable luxury charter experience. 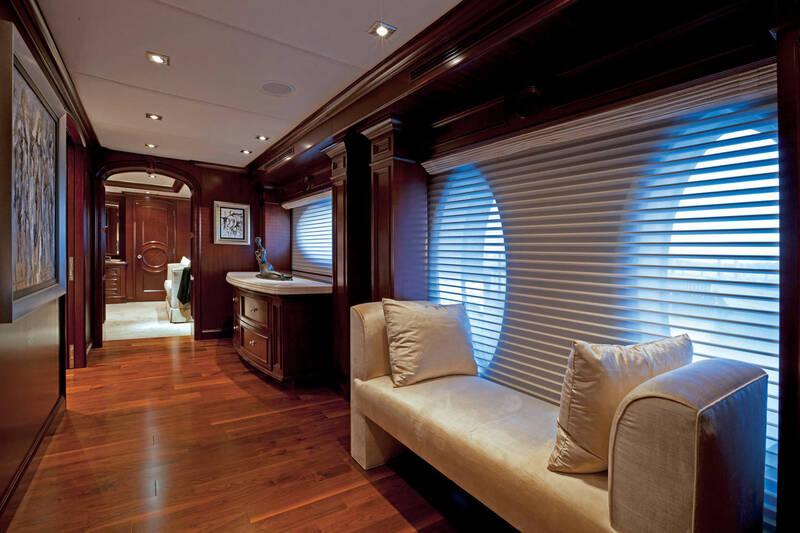 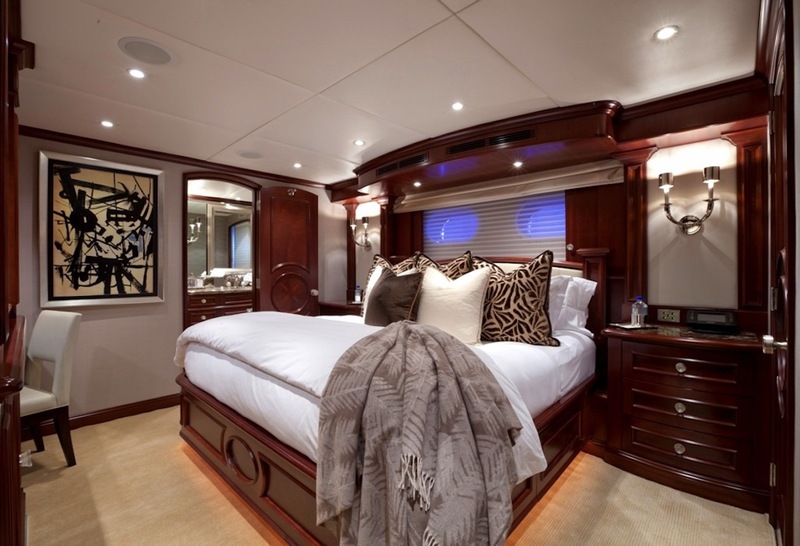 This luxury motor charter yacht luxurious accommodation for up to 10-11 guests in 5 cabins, all with their own en-suites, as follows: Her owner’s suite includes a private office and a lovely en suite bathroom with dual entries from the bedroom and office area. 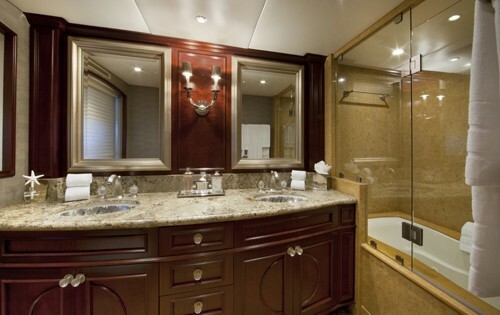 The owner’s cabin also a large Spa Pool tub, his and her area, and an expansive closet and dresser space. 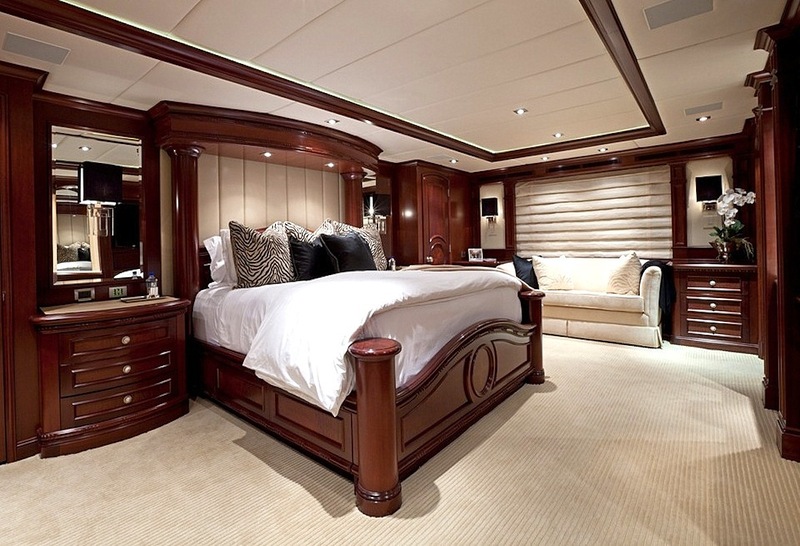 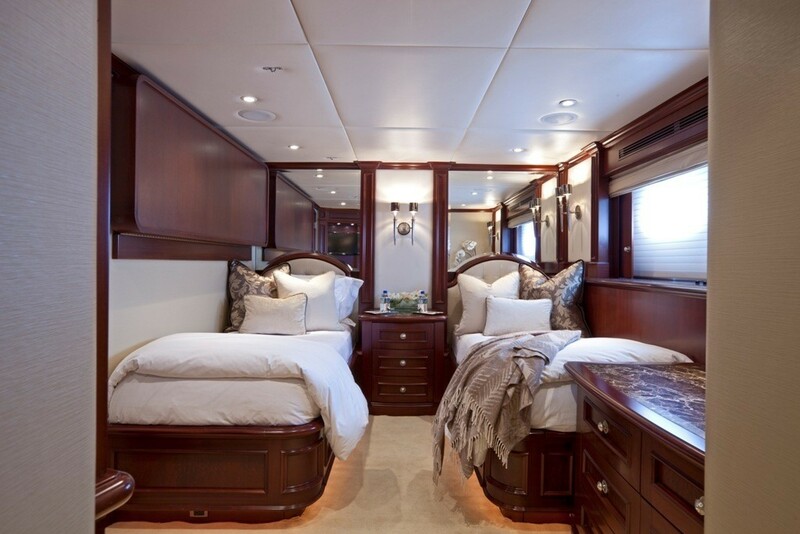 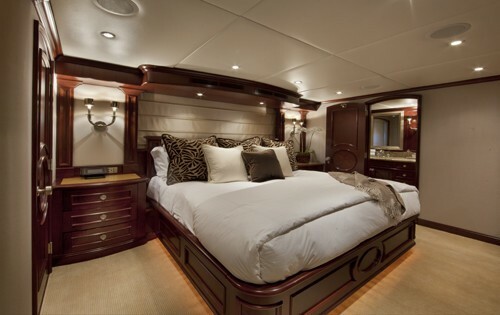 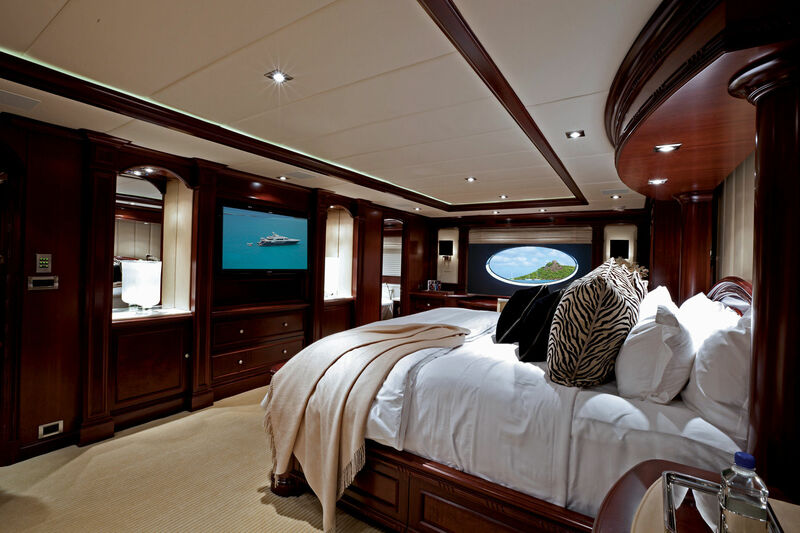 The motor yacht's guest staterooms, with the first being towards amidships/aft with walk-around King Bed, en-suite bathroom. 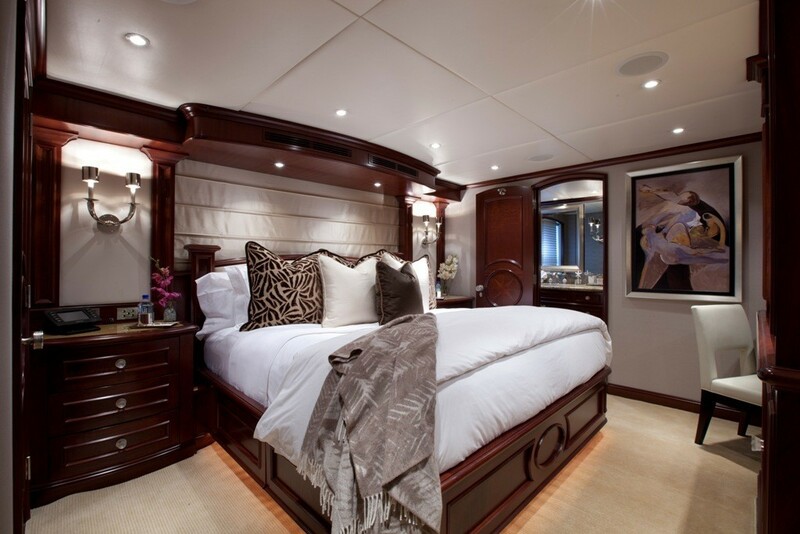 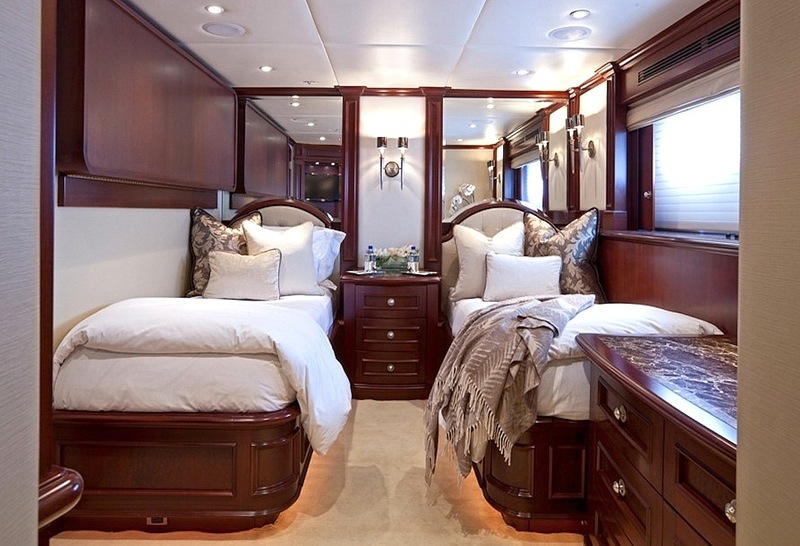 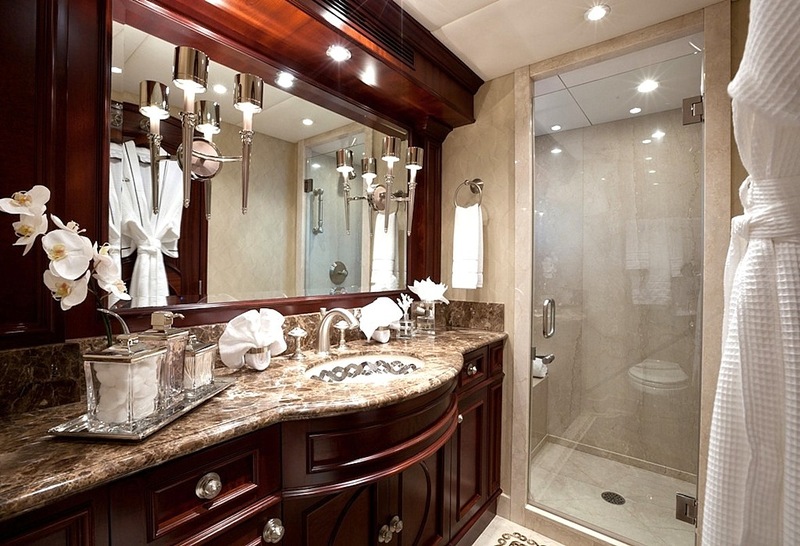 A second Guest Stateroom offers a King Bed and en-suite bathroom. 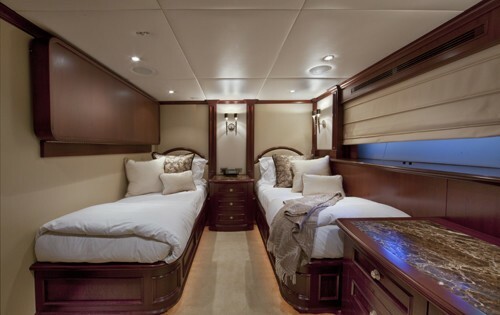 The yacht’s third Guest Stateroom also has a King Bed, with en-suite bathroom and the yacht’s fifth guest stateroom is also on the lower deck with two twin beds, plus Pullman bunk. 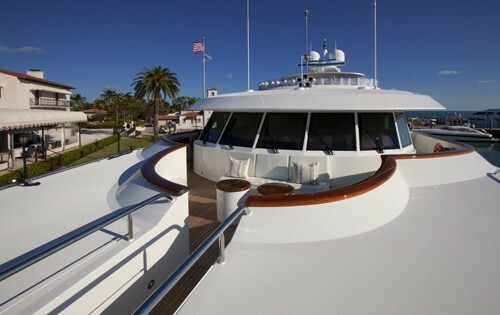 Yacht COCKTAILS has luxury amenities and extras including a 34 ft custom made intrepid boat, an 17 ft / 5.18 m Novurania / 115 hp (4 stroke) RIB (with Beach Ramp for easy access). 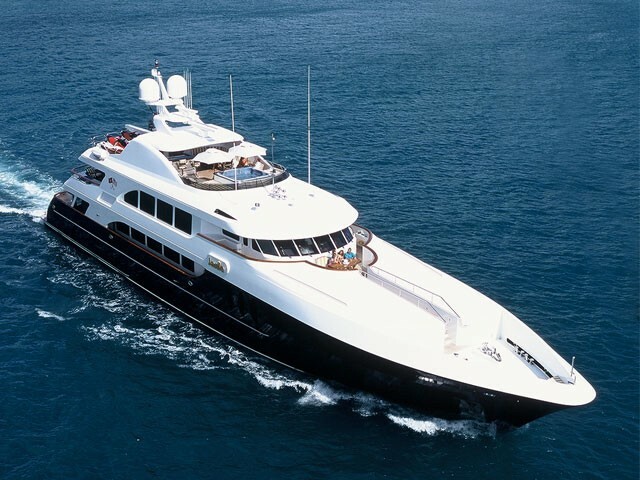 She also has wave runners, ocean kayaks a complete saltwater fishing outfit, SCUBA gear and compressor, water-skis, and wakeboard and assorted towable water toys, and fantastic communications and electrical entertainment systems.